The Phnom Penh Post featured the effort of a group of Khmer Wikipedian editors including yours truly. Vantharith Oum led the team in Cambodia to make edits and create new articles in Khmer language while I, since located in Singapore, led an online team via Skype to make edits and create new articles about Cambodian prominent women in the English Wikipedia. March is the month of Pisces (which secretly is my birthday month!) And, the International Women’s Rights Day every year is my birthdate. This year, I was so happy to do such a cool project during my birthday, of course without letting any one of my volunteers know it was my birthdate. By the way, enjoy the article below. If you are interested in writing the history online, do get in touch with me via bluealdyblog[gmail].com. Wikipedia’s Khmer language coverage is patchy at best, and almost non-existent when it comes to profiling the country’s most important women. This weekend, online activists are joining forces to flood the site with new entries. Browsing the Khmer-language version of Wikipedia, knowledge seekers can find entries for many prominent Cambodians. Prime Minister Hun Sen, opposition leader Sam Rainsy and architect Vann Molyvann all feature. Even the late National Police Commissioner Hok Lundy has an extensive biography. But almost all the entries are for men. While Mu Sochua, arguably Cambodia’s most influential female opposition lawmaker, has a 713- word article on English Wikipedia, she doesn’t have an entry at all on the Khmer site. 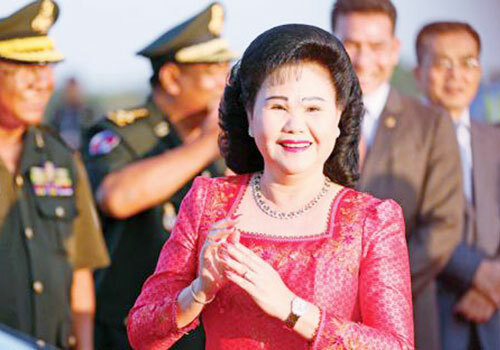 Nor does Bun Rany, wife of Prime Minister Hun Sen, nor Somaly Mam, the disgraced celebrity human rights activist. The late 1960s and 1970s singer Ros Sereysothea is one of only a handful of female profiles on the site. “I think women’s voices are underrepresented – there are many issues that are strongly concerned with women, and they lack the opportunity to raise their voice,” said Oum Vannarith, public relations director at Zaman University and prolific Wikipedia editor. Vannarith said he had no specific data on the number of women on the site’s Khmer edition, but it was much less than the 55 entries on English Wikipedia’s Khmer women category page. To mark International Women’s Day, Vannarith is planning to host a gathering of Wikipedia editors at the 5D Lab Cambodia community centre to add new entries about Cambodian women to the Khmer language version of the site. About 10 Cambodians in other parts of the world are also expected to chip in at the same time. “We will ask participants who they get inspiration from, who they admire, and then we will identify key people … and then we will teach them how to research and add to Khmer Wikipedia,” he said. According to Vannarith, Khmer Wikipedia had 4655 articles as of March 5. This places it ahead Kashubian, a Slavic language spoken in parts of Poland, and behind Sardinian in rankings. While the approach of the 5000-article-in-Khmer mark is a significant milestone for Wikipedia since the local language pages launched in 2013, Vannarith said that the lack of female editors was among his biggest concerns as an editor. However, he added that the gender imbalance was not unique to Khmer Wikipedia. “The general issue is the common issue of the Wikipedia movement, even in well developed countries – not many participants are women,” said Vannarith. According to Wikipedia’s own article on the site’s gender bias, between 84 and 91 percent of Wikipedia editors are male which leads to “systematic bias”. In an interview with the BBC last August, Wikipedia founder Jimmy Wales admitted that the site had “completely failed” to fix the imbalance. Web media consultant and blogger, Kounila Keo, who will address the March 8 workshop via Skype, said the efforts were part of an international campaign to enlist female editors. Kounila said via Skype from Singapore that she though female participation in the Wikipedia community was as important as male participation, adding that she was personally behind much of the editing of Cambodian women on English Wikipedia. “If you’re a female Wikipedia editor, you tend to think more about entries about women,” she said.